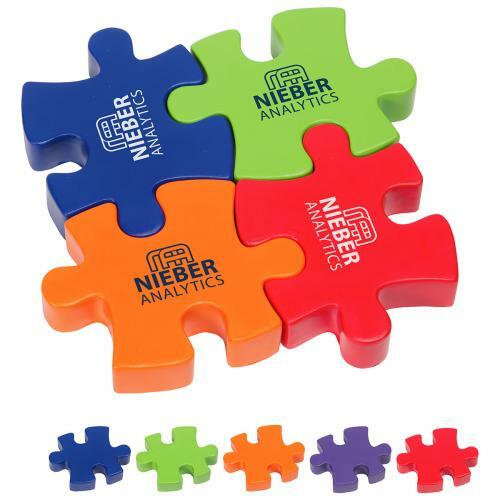 Connecting puzzle piece stress ball sets are a great choice for businesses and organizations promoting teamwork concepts. We offer 2, 3, and 4 piece sets. Mix/match your colors to meet your needs. You must meet the minimum quantity shown (75 pieces) per unique imprint. Use the special instructions box to let us know your color assortment and/or imprint per color puzzle piece. All sets are individually poly-bagged. Pricing is per set of 4. Example: if you order 150 quantity this is 150 sets of 4. Item Size : 5-1/4" x 5-1/4" x 5/8"
Imprint Area : 1-1/4" x 3/4"